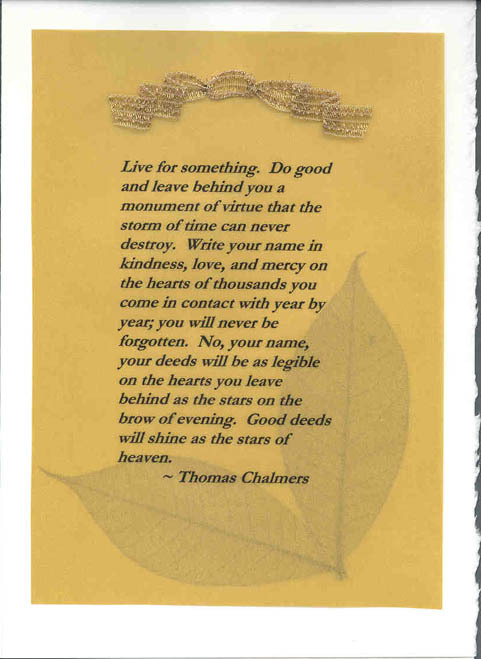 Is your name on the back of your cards? 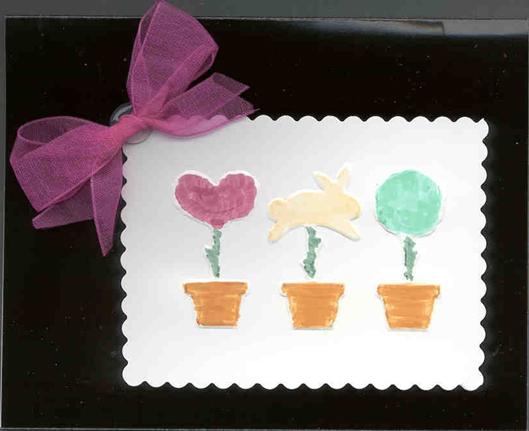 Other sayings: "Made with love by" and "It's not Hallmark --It's better because it was made by"
Bright and colorful for a baby shower. 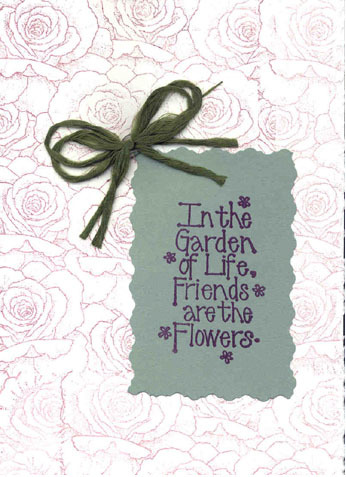 A bright and sunny card for any occasion. 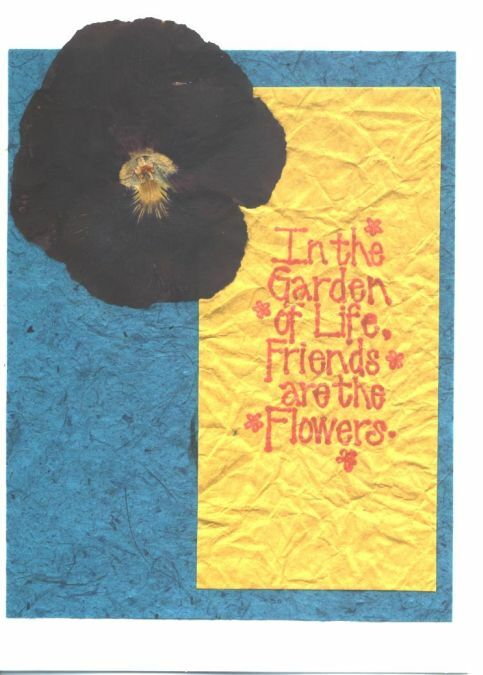 Same materials (stamp and dried pansy), but two different looks. A special greeting for a new friend. 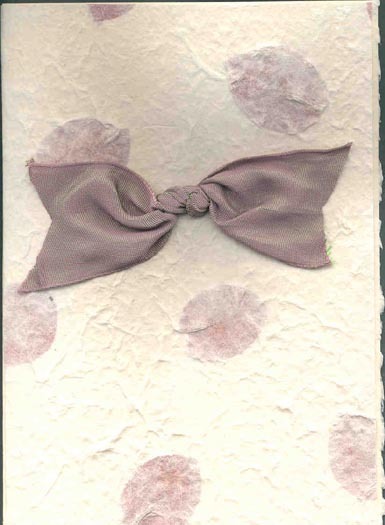 This handmade paper with flower petals in it was too beautiful for any other adornment other than a simple pink/green iridescent ribbon. 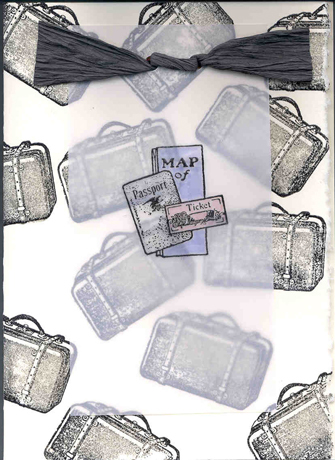 This card has a "Bon Voyage" sentiment and a "well traveled" look. 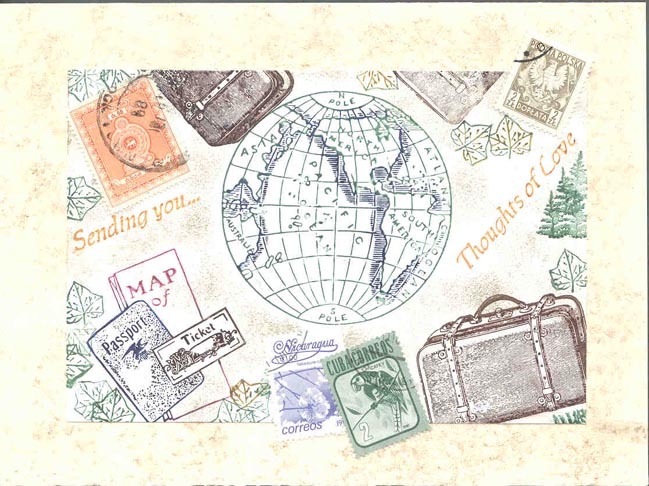 It's rubber stamped and accented with real international postage stamps. I really love the soft look of this card. 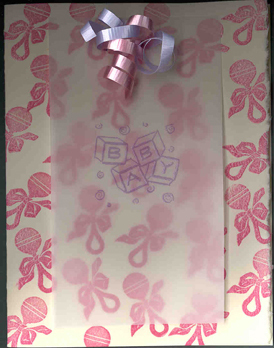 A sweet and feminine way to say "happy Mother's Day" This is recycling at it's best! 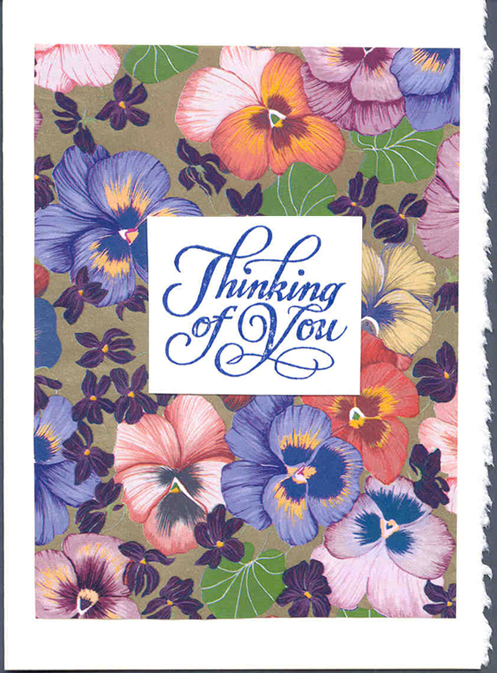 I had a used red Hallmark thank-you card. 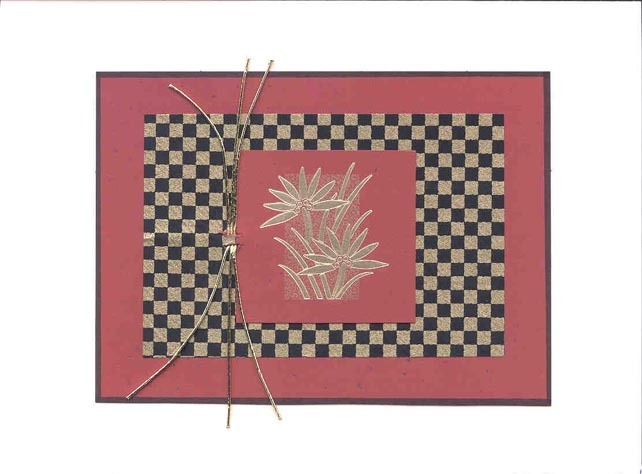 To re-purpose the card, I put the black stripe around the back panel of the card, cut out the gold embossed floral from the front of the card, and I added the black and gold check paper and the paper cording. 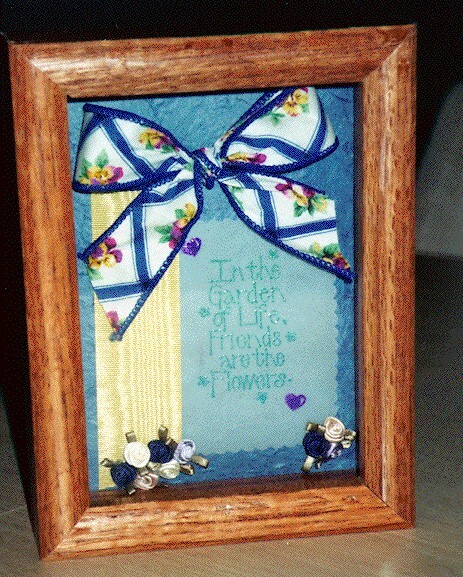 The paper cording was cut to length and pushed through slits made with a razor knife. 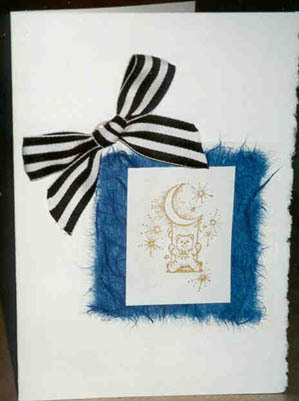 It was transformed into a new card for any occasion. 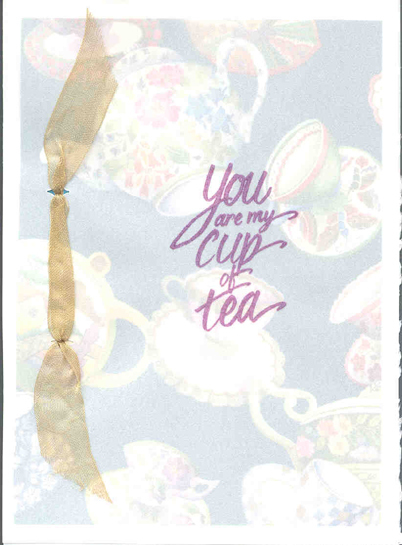 Vellum over tea-themed wrapping paper makes a great "thinking of you" card. 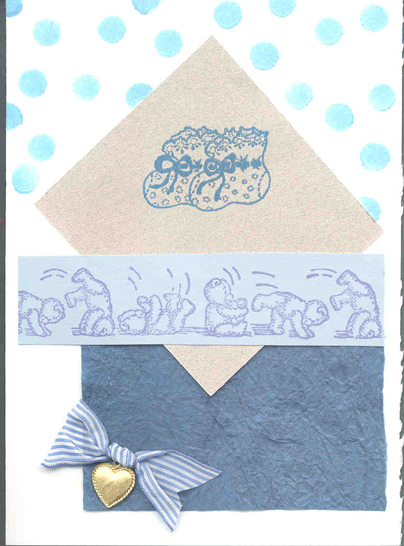 A joyous "Welcome New Baby Boy" card. 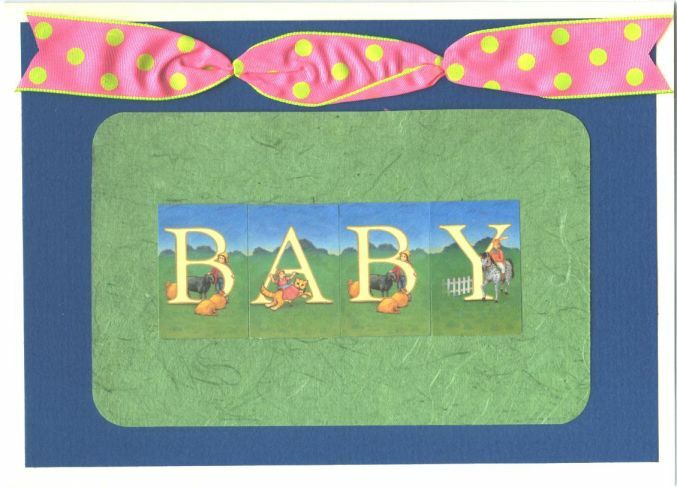 A cheerful "Congratulations on your new baby" card, using the adhesive mesh from Stamp Storage & More. 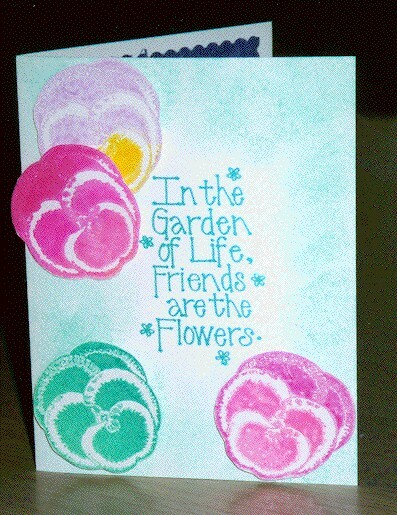 A sweet get well card for a friend. 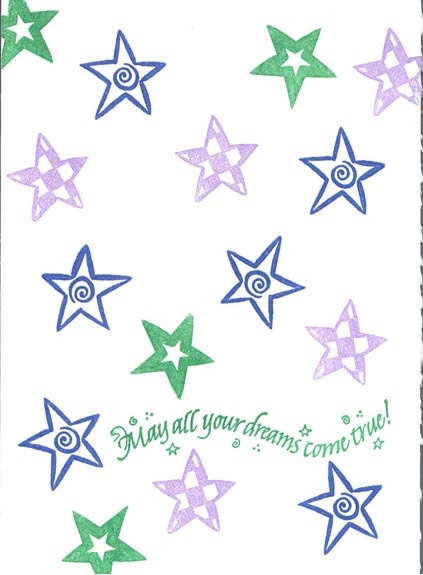 A fun card for a friend going on a cruise! 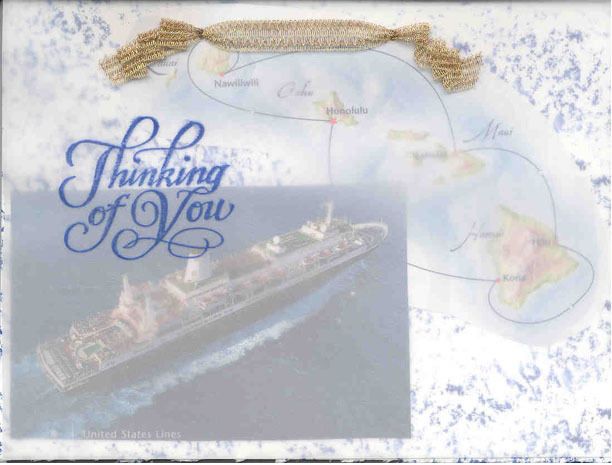 Sponge the background, use photos from the cruise brochure, overlay with vellum and your greeting. 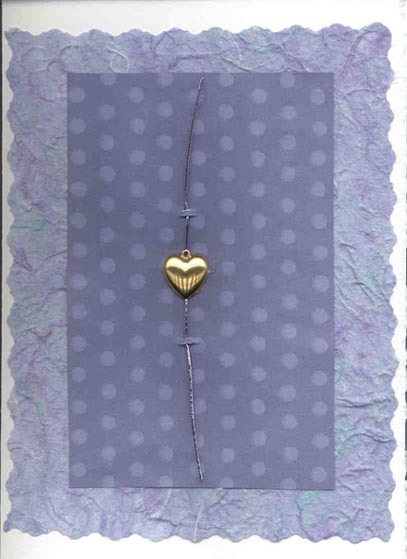 Tie to the card with a lovely ribbon. Simple & fun. 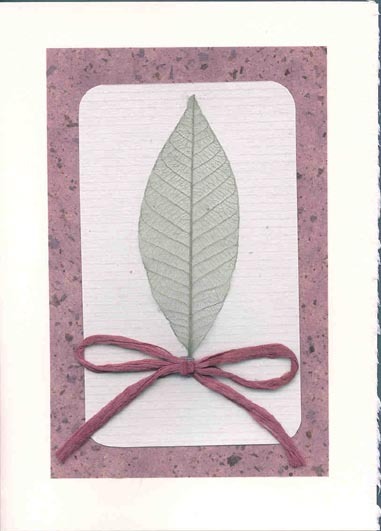 Inside reads: "So sorry you have to leaf". 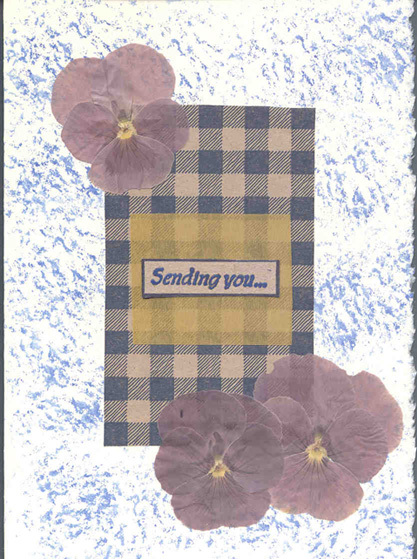 A fun card for a friend moving out of the area. 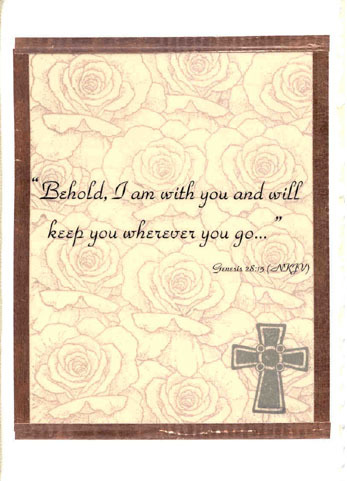 A bible verse printed on vellum over a stamped background and "framed" with copper metal tape. 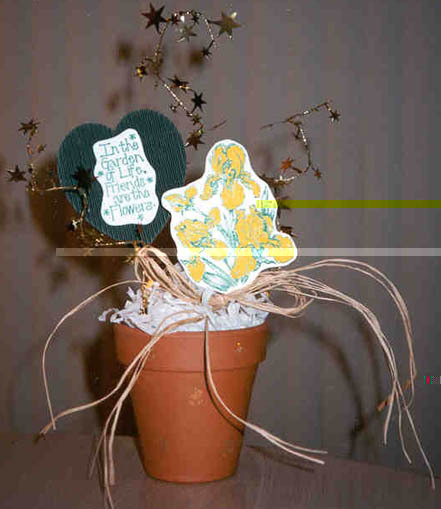 What a great look for a fond farewell card! 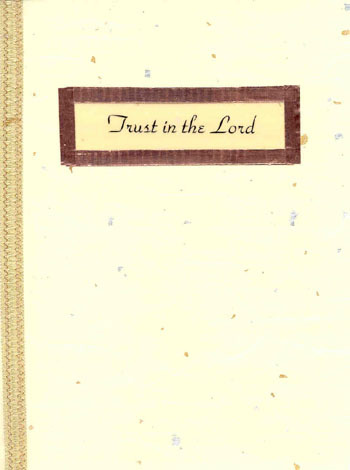 This is the inside of the Christian card (with the copper tape). 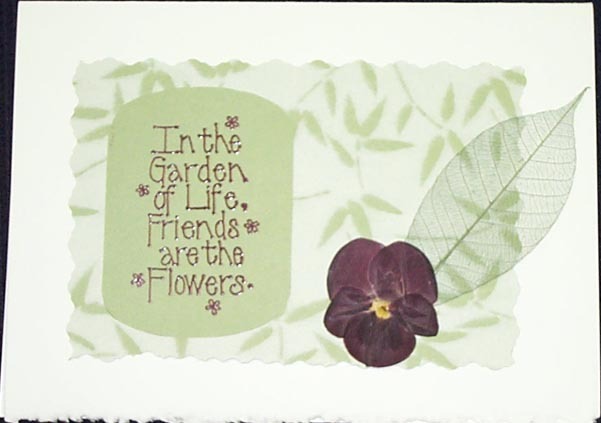 A fond farewell card for a friend. 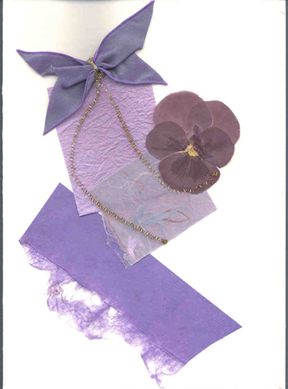 This card uses a sheer fabric leaf and a dried pansy. 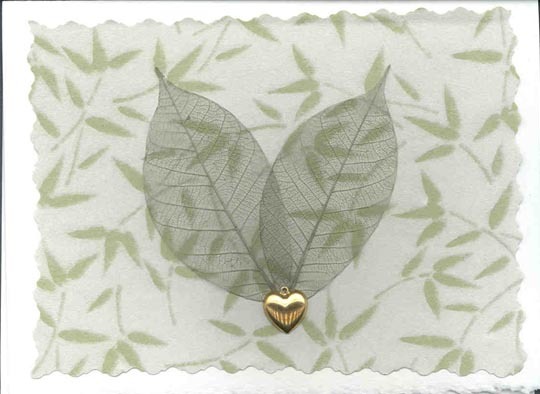 Beautiful paper with sheer fabric leaves joined by a heart charm. 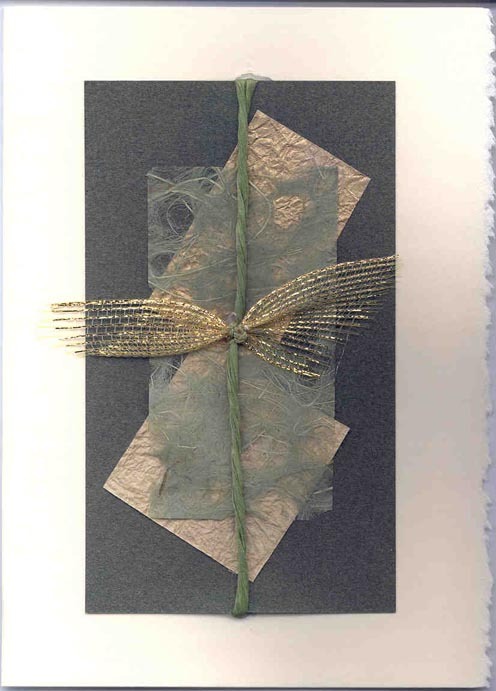 The paper cord is weaved through slits in the card. Don't be afraid to cut interesting edges on your cards. It adds interest! Perfect for a graduate. 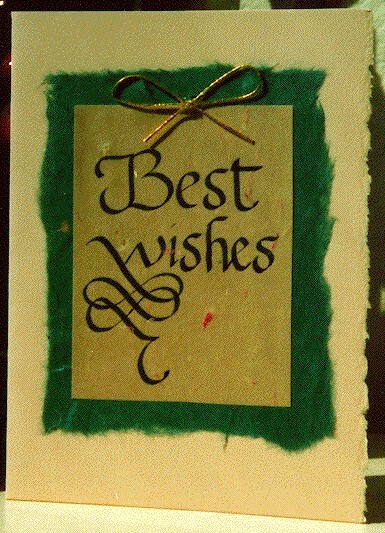 The decorative green leaves are placed under the vellum. 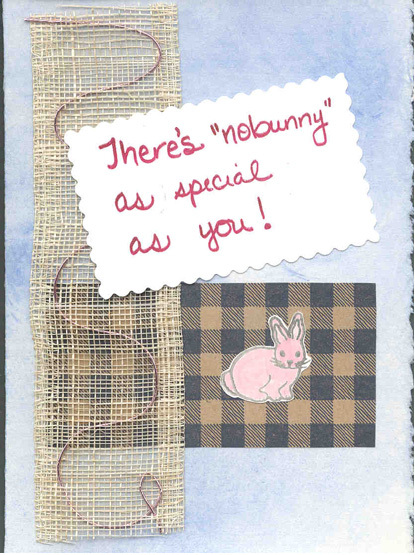 Just in time for Easter or Mother's Day or just because! 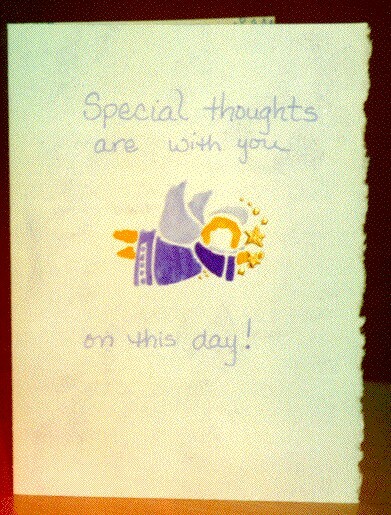 ...Thoughts of Love! I love this checked craft paper. 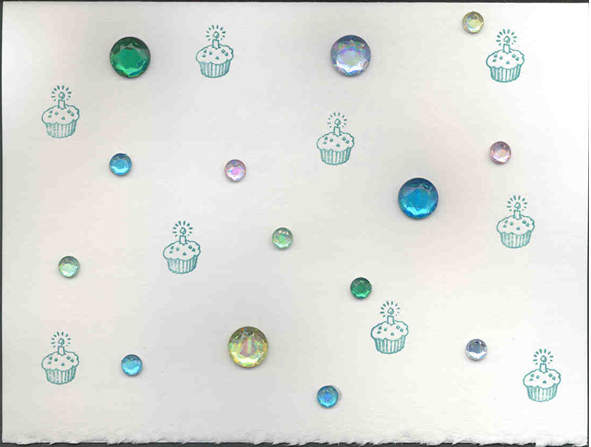 Pretty paper can set the tone for a card. 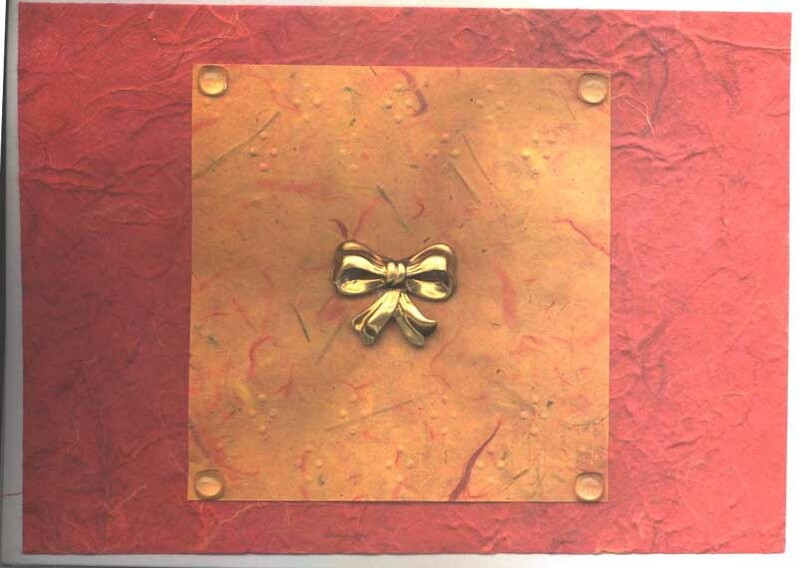 This card uses a tassle to hold the sheet of gold-tinted vellum tucked inside the card. 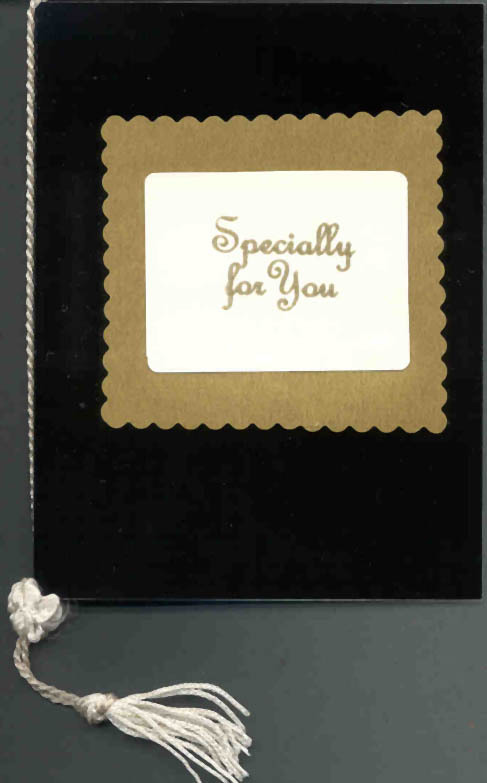 A glossy black card for a baby greeting?? Yes! Checked background was made by stamping through mesh. 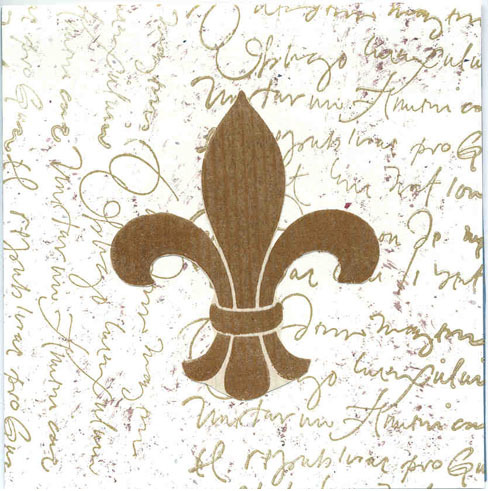 There are several embossed papers available in a variety of patterns. 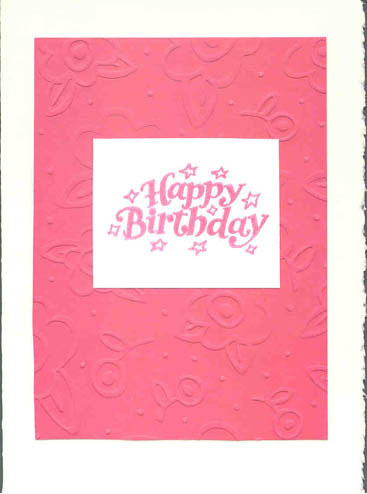 The papers are beautiful and make a card look wonderful very quickly and easily. 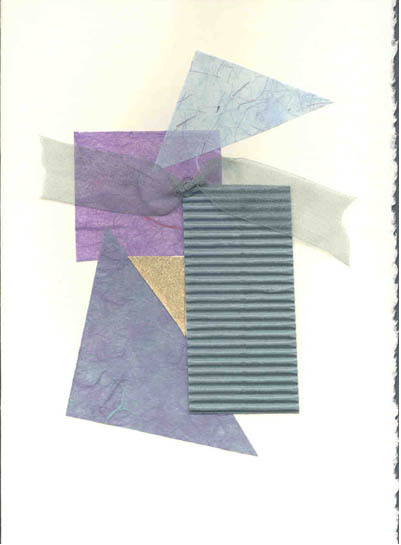 A collage card using 5 different papers and a sheer ribbon. Perfect for so many occasions! 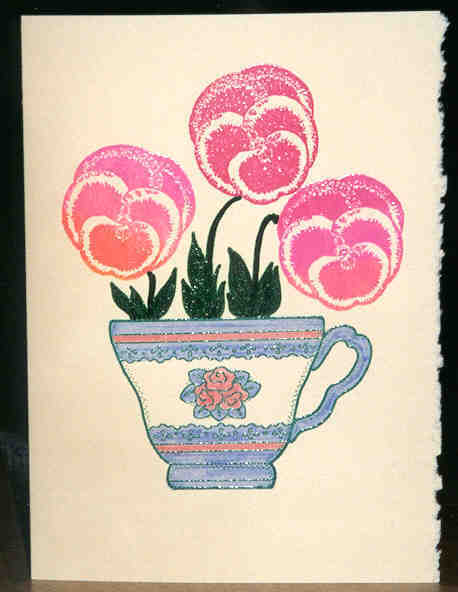 A topiary stencil is dry-embossed, then colored, and glued to a glossy black card, with an accent sheer ribbon. 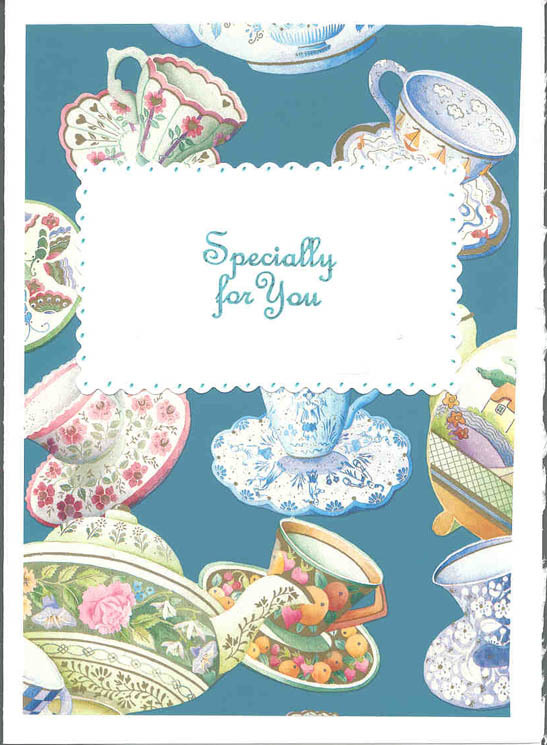 A sweet card for a variety of occasions. 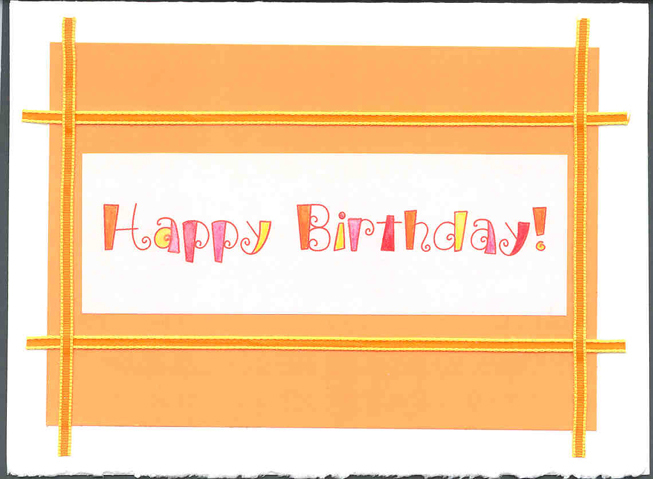 A bright and colorful way to wish someone a happy birthday. 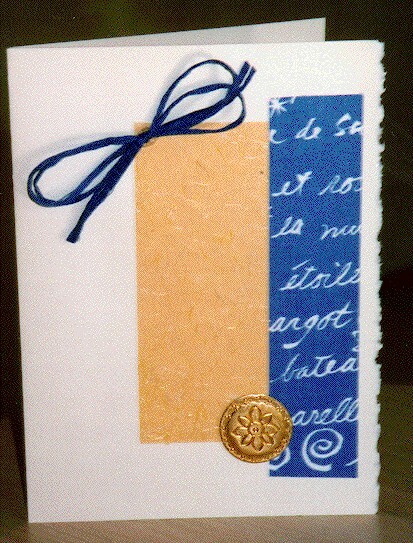 Suede paper is beautiful and elegant! 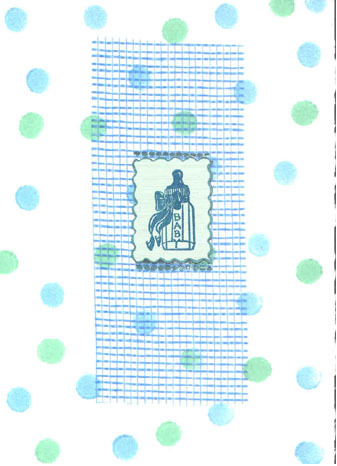 The image of the rubber stamp is transferred onto the suede paper by applying a hot craft iron (look for a travel iron or one without holes on the flat surface of the iron.) 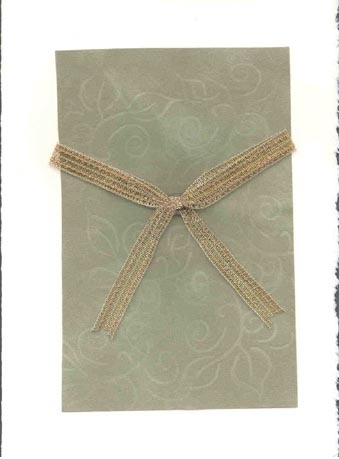 Suede paper is available from Rubber Romance (714-527-7124). 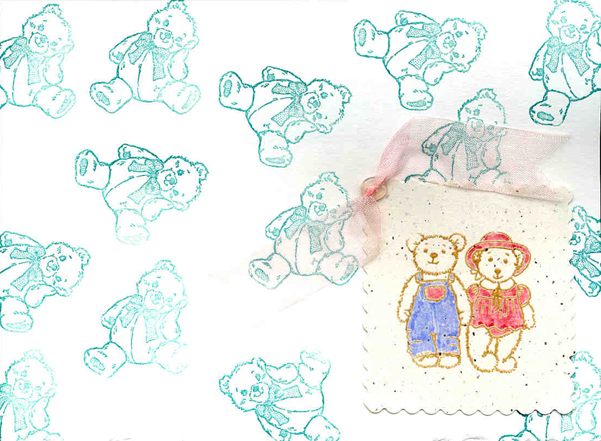 Have a "beary" happy birthday! 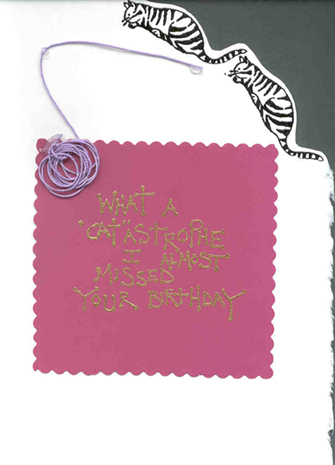 Sometimes rhinestones are the way to celebrate a birthday...Sparkle on your special day! Congratulations on your new baby! 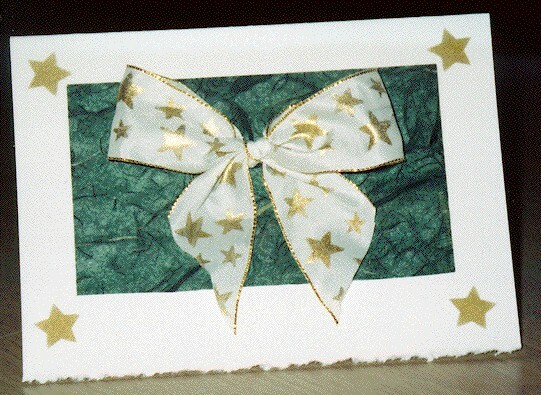 A layer of vellum allows for another image or special message. Bon Voyage! 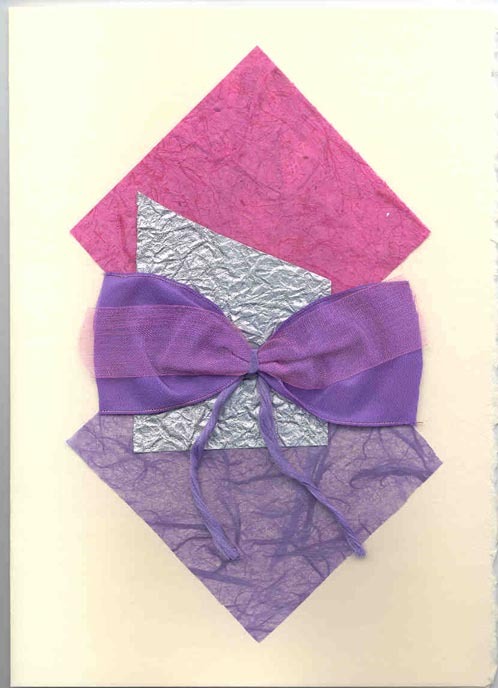 A layer of vellum and a paper ribbon accent this fun card. 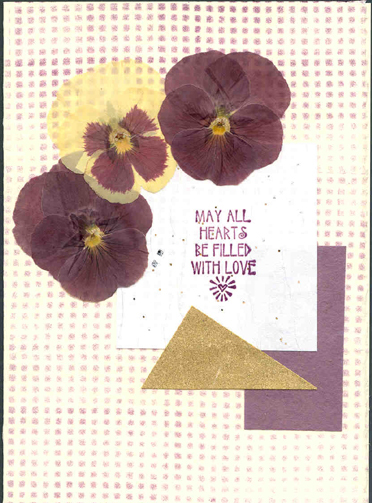 A collage of papers, ribbons, and a dried pansy --thinking of you! 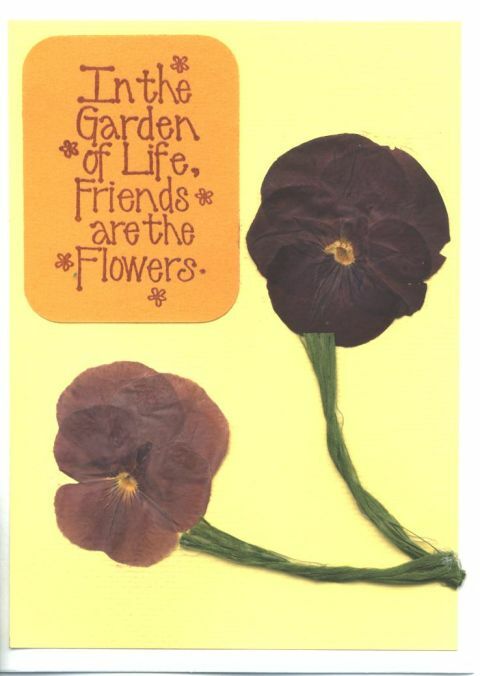 Dried pansy flowers and the check-pattern background makes this a memorable bridal shower card. 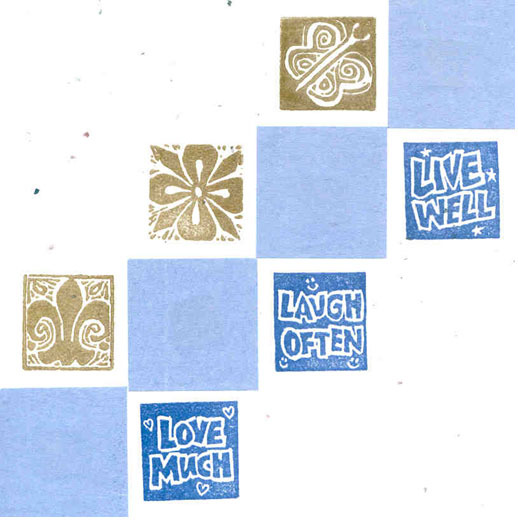 A fun idea from the June 1999 issue of Stamping Arts & Crafts magazine. A vertical, 3-D card! 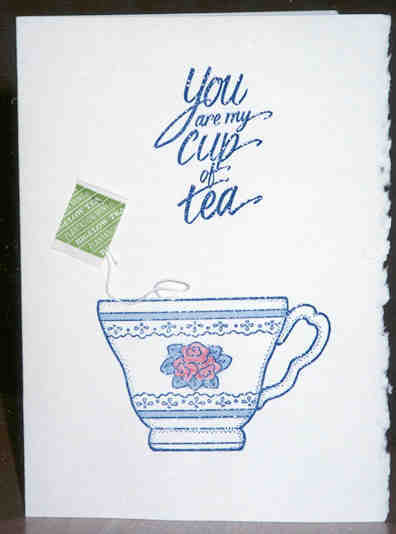 A real teabag is taped to the inside of the card. 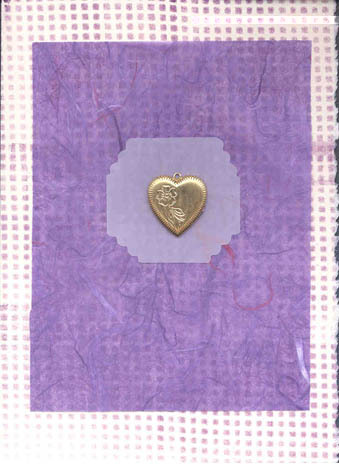 The the tag and string come through a slit in the card to show on the front. The aroma is terrific! A sweet card for a baby shower This is a beautiful birthday card that I received (handmade by my friend). Thank you, Tracy!! 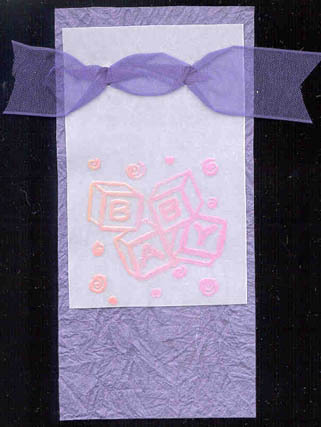 Stencil art Find a pretty ribbon and the card becomes a present! 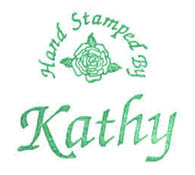 � 1999-2001 by Kathy's Handmade Cards, except where noted. All rights reserved. More cards and ideas will be added in the future! Please come again!